A Light Emitting Diode, better known as LED, is an old technology quickly becoming the standard in pool lighting. Discovered in the 1920s, LEDs were usually confined to small circuit indicator lights like you would find on a remote control or kids’ toys. Their efficient power usage was ideal for small devices that had limited battery power. They were limited to that role because initial LED technology proved too weak for area lighting. The popularity and technology development of LEDs have taken leaps and bounds in the last few years due to the government enforced phasing out of the standard incandescent light bulbs. What made your old incandescent bulbs both fragile and electricity hogs is what gives LED the advantage. The old lights use a filament based design that requires the heating of the metal filament wire to create illumination. This process creates the byproduct of heat that is actually wasted energy. That heat is energy being burned off into the space rather than being turned into useful light. Mind you, you are still paying for that wasted energy usage. LEDS on the other hand create light from the rapid movement of electrons through a semiconductor material which is then directed and amplified using reflecting mirrors. This process of illumination creates a super efficient lighting system meant to make your pool all the more pleasurable. The growth of LED lights can be attributed to good old Uncle Sam and his want to go green. As you know, incandescent bulbs were phased out and eventually completely replaced by Compact Fluorescent Lights (CFL) and LEDs. This push was to relieve pressure put on the power grid by the inefficient standard bulbs. This changeover created a boom in development to make LED technology stronger, more durable and less expensive. All that flash and dash science stuff is fine but what pool owners normally want to know is how will this affect their pocketbook. If you switch to LED, I would suggest buying a larger wallet because you will be saving loads of cash in long run. There is a bigger upfront cost (by a couple hundred bucks) but by the time you need to replace the fixture, it should have more than paid for itself in savings. An LED saves you money in two ways; operational and bulb replacement costs. The average kilowatt per hour cost in the US is 12 cents. 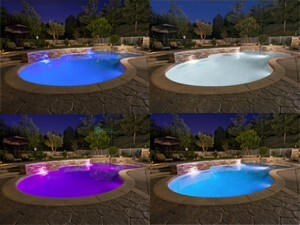 Incandescent Pool lights are available in 300, 400 and 500 watt versions with a large portion being the latter. The new generation LED replacement bulbs boast pool versions that run as low as 42 Watts, yes 42 watts. That is more than a 90% savings over the 500 watt option. One sidenote, brightness of the light depends on the color setting, white is brighter than green, but green is brighter than red and so on; we discuss this further down. If you do not believe me or the wonders of LED lighting, this cost calculator will bring you to the light. The savings actually annoyed me, knowing how much I could have been saving all this time just by changing the bulb. Replacing a pool light bulb is not a difficult process; a little screwdriver work and a rubber gasket there, add a bulb here and you are done. But by no means is it fun. Over the life of a pool light, you may require 5 – 7 bulb replacements depending on usage. Standard halogen lights are normally rated for 1000 – 2000 hours of illumination. The Colorsplash LED replacement bulb on the other hand is rated for up to a 50,000 hour lifespan. To make a comparison, with around-the-clock (24 hours a day) illumination, the halogen would burn out in 3 months. With the same nonstop illumination, the Colorsplash would be expected to last more than 5-½ years. With each of those bulb replacements the lens gasket should be replaced as well. Let us also deduce the average replacement bulb is $20 and the replacement lens gasket is $20 too. No one expects a light to run 24/7 but think about how long that projects the bulb’s lifetime. Another great thing about LEDs is that they do not degrade overtime. Their watt usage stays the same from day one of installation. The filament bulb alternatives may dim or begin to pull extra power in the later stages of the install. The costs shown above are for general maintenance, not counting the couple thousands of dollar you are spending on electrical costs to run the average 500 watt light. Sure, the standard halogen light is less expensive up front but the back end costs are a monster. The electrical use and maintenance costs will surpass virtually any LED pool light on the market today. 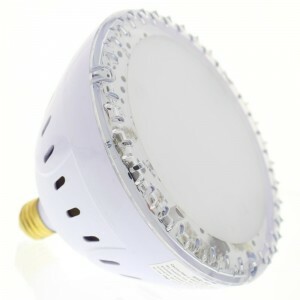 Besides the obvious cost advantages, LEDs have the plus of versatility over the old bulb styles. Halogen lights of the past were only available in the standard white until some manufacturers added colored lens options for their fixtures. As cute as this option was ten years ago, it proved to be a pain in the long run. 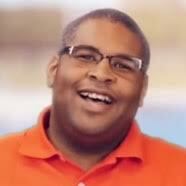 After pool owners complained of losing, breaking, and being annoyed at the process of changing lenses, the light makers turned for a new path. Most pool owners were not thrilled about having to ta ke a dip every time they wanted to change the mood ring on their pool. The most common LED bulbs have the ability to change colors built into the hardware; which can offer base solid colors like white, red, blue, or green as well as dazzling lights shows at the flip of a switch. My favorite part about the light shows are the names they are given. For example, ColorSplash names theirs Northern Lights, Supernova, and Patriot’s Dream. I can hear the John Philip Sousa playing already just reading the latter. The base colors and lights shows are preprogrammed into the bulb to be accessed and cycled through using a light switch. For even easier operation, the manufacturer Pentair provides an optional controller for their Intellibrite LED. The Intellibrite optional controller resembles a dimmer switch that lays out its color formats for easy perusal. If you’re lucky enough to have a high end automated control system, you should be able to change the color setting from your wall or handheld interface. An example of the high end controllers that have sway over light color settings are the Jandy Aqualink, Aquapalm, Pentair Easy Touch and Intellitouch. But if you are one for the more classical look of pure white, do not fear – there are options for you as well. Pool owners have the option of choosing Pure White LED replacement bulbs (120V or 12V) or whole fixture replacements to match their obsolete fixtures. A great plus of white LEDs is they are significantly cheaper than the color changing options. Unlike the color changing version, Pentair’s Intellibrite White LED has watt equivalency ratings which match your old fixture’s brightness whether it was a 300, 400 or 500 W. This makes gauging the necessary light replacement a breeze. Unfortunately most color LED options do not provide the same straight forward watt comparison, but prefer the more abstract “Lumens” rating scale. This is mainly due to the way the varying colors’ wavelengths are carried by the water. For example, a Pentair Intellibrite 5G spa light displays white light at 850 Lumens but can only produce 350 and 140 lumens for red and blue respectively. Again this is not a flaw of the light or the diode system; it is basic physics that specific colors on the spectrum do not carry well in water. The most apparent downside of LED Lights are the upfront and replacement costs relative to incandescent bulbs. A replacement LED bulb for a standard incandescent fixture is in the ballpark of $150 to 250 each. That price is easily covered by the expected savings over the life of the bulb as we talked about earlier. But an LED fixture (i.e. Pentair Intellibrite, Hayward ColorLogic) must be completely replaced once the bulb burns out. LED fixtures are sealed by the factory to prevent water leaks, removing the possibility of damage from faulty gaskets. I for one, would not want the health of my $500 LED fixture dependent upon a $2 piece of rubber, so I consider it a good design. Well that does it for this installment of Inyo’s blog. I hope you learned all about LEDs but if you want to know more please give our techs a call at 877-372-6038. My pool is not very well lit. Probably could have used a 2nd light. I have the Hayward omnilogic system. Which light would you recommend to make the pool as bright as possible? Thanks so much for your time? An Omnilogic you say? Those are pretty fancy, I would like to get my hands on one of those. The brightest LED Light we offer is the Pentair Intellibrite 5G, but Hayward advised me they do not communicate well with the Omnologic system. I would suggest instead, the Hayward ColoLogic (120 V) or the Universal ColorLogic (12 V.) Either should be a seamless installation for your pool controller. It will not solve the brightness issue, though. In search of help. I recently purchased a new house with a pool. There appears to be some type of rope lighting around the coping of the pool and deck stairs. There is a brown D-shaped enclosure on the outside the screen which contains a color wheel, light wit two prongs a fan and a push button which turns the fan and light on. The unit is connected to a 300 W transformer and switch. The previous owners left no information on the equipment and I cannot find a manufacturers part number. Any ideas? It sounds like your pool has fiberoptic perimeter lighting; and that box is the illuminator. I recently purchased 2 of the LED color lights and installed them. No difficulty there. Both lights are on the same circuit and first night after installation (blue mode) one of the lights went out. It stayed out for about 10-15 minutes and then came back on and stayed on after that. It has done the same thing for several nights. The other light has stayed on through the time cycle. I am not sure what would cause that. What kind of lights were they? Make and manufacturer? How would it look if I used the smaller 250w white light and the 500w blue lense? Silly? 21,000 gallon pool. It would look dimmer than what it would look like with a 500-watt lamp. There isn’t really any other way of describing it.